I have had no luck whatsoever in getting any action out of the new Parallax transceivers (part # 27982). Attached is the SXB code I have been using to test the parts. Two transceivers are on the same PDB board. One sends out 4 'U's, then a '!' then a 'A'. The second transceiver is then quered to see if there is a '!' on board and if so it looks for an 'A'. These two characters are never found. I have no idea about how to proceed from here. Any ideas out there? Looking at your code, it appears that you have two Transceivers connected to the same SX unit. Is that correct? The SX is a single threaded processor which means that you can only process one thing at a time. 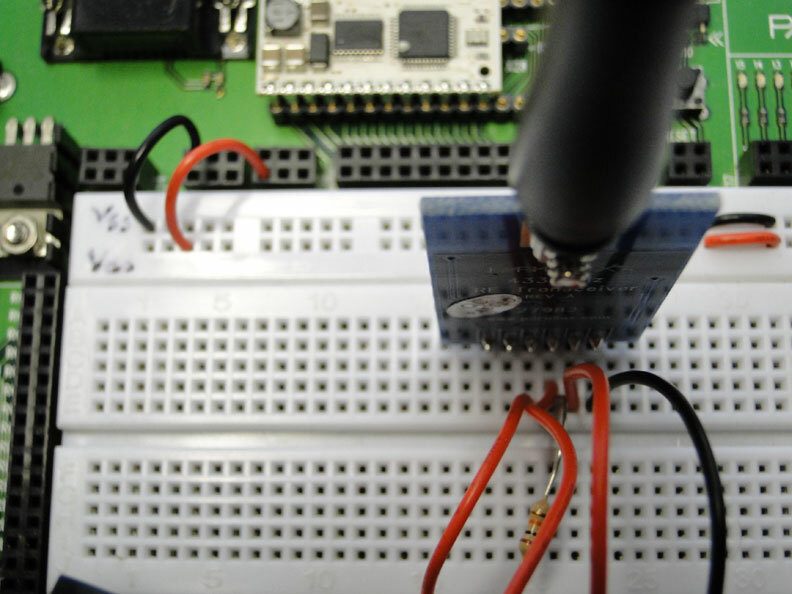 By the time the receiver portion of the code is running, the transmitter has already finished sending the data. There is no data buffer to 'capture' the data stream in other words. To "test" to make sure that your Transceivers are working properly with each other, I have attached a simple schematic that lets you test them without a micro controller. Thanks. I'll give this a test soonest. I did set up separate prototype boards with one sending and one receiving which gave me no evidence of communication. I gather from this that the receiver has to be continuously looking for input. For that I would take the TX portion of code from what I sent and have it execute every minute or so on one board. On the other board I would execute the RX portion of the code I send in a continuous loop. If I just wire up the transceiver with the LED I get the LED permanently on unless I ground transceiver pin 5. The second transceiver has no effect on the LED whether or not pin 5 is grounded. The PDB LED from pin 3 of the RX module has become very feeble but it still does not respond to whether or not pin 3 of the TX module is high. Pin 3 of the TX module also has a brn, blk, orn resister to ground. Something doesn't quite seem correct in your setup or with the Transciever units. The "test hookup" should indicate via a LED on the receiver if the button on the Transmitter is being pressed or not. The main thing to look for is that the 'TX-RX/SEL' pin is tied to Vdd when using the Transciever unit as a Transmitter, and that the 'TX-RX/SEL' pin is tied to Vss when using the Transciever unit as a Receiver. 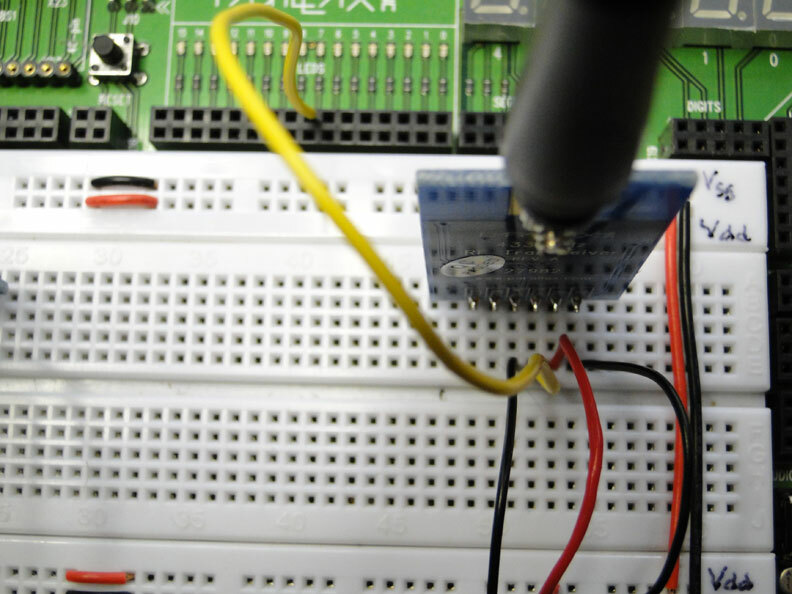 Other than that you can treat the DATA pin as an INPUT on the Transmitter, and as an OUTPUT on the Receiver. 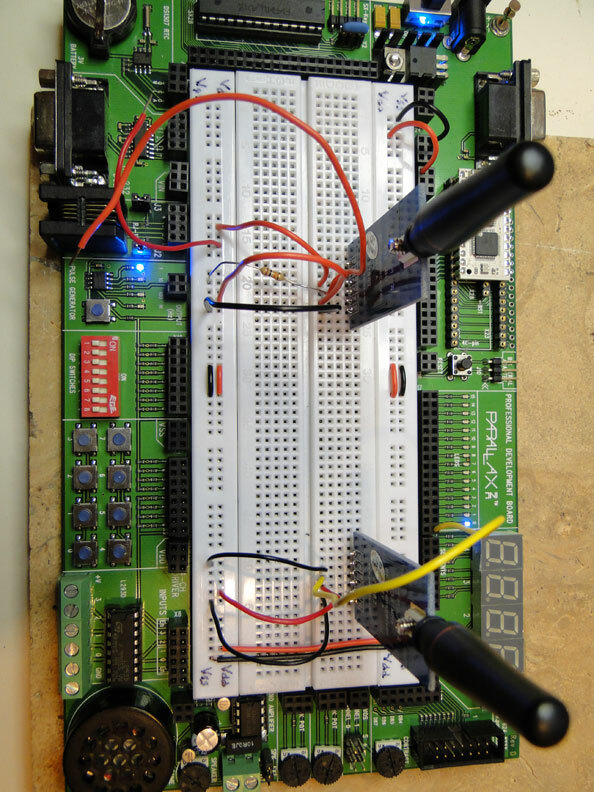 Once this basic communication configuration can be established, you can send more complex signals such as serial communication over the DATA line from one Transceiver unit to the next. 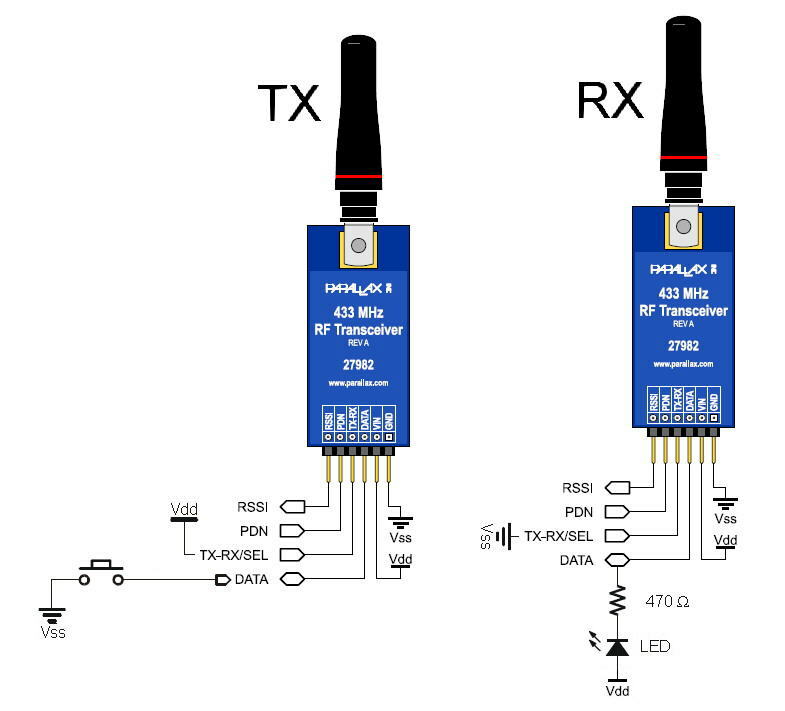 Is there any way that you can provide a picture of the Transmitter and Receiver setup as you currently have it connected? Here is a picture of the setup. I agree that a wiring error seems most likely. To try to deal with that I rewired the units with the units reversed from the previous try and in the same orientation as your picture. The button in my wiring is replaced by connecting two wires, one from RX pin 3 to a wire from Vdd. It's hard to tell, but it looks like the Receiver is off by one set of pins on the Bread-board... i.e. PDN looks like it's connected to Vss where it should be left open. That being the case, I'm not sure if applying power in this way to the Transceiver would cause damage. I think the connections are okay, at least in terms of the issue you raised. Better pictures to check connections are attached. I have made no changes between the first picture and these. My apologies, the schematic I gave you was based on our older RF TX/RX units. Since I don't actually have a Transceiver, I was going by the datasheet and the assumption of the older RF units. Earlier today I had a colleague of mine test the schematic that I had originally posted and realized that the input to the unit / output from the unit is handled differently than it was in the older units. The updated corrected schematic should "test" the original thought I had in mind. Could you comment on my plan for setting up a two module approach? I gather that the receiver has to be continuously looking for input. To test a two module approach to do that I would take the TX portion of code from what I sent and have it execute every minute or so on one board. On the other board I would execute the RX portion of the code I send in a continuous loop. I should say that the test light goes from strong to weak, not on to off. I now have code that works to test for character transmission. I want to thank you Beau for the help. It justifies once again my decision to go with parallax parts. I should have some Transceivers by Monday so I can determine the "strong to weak" issue you are seeing with the LED. Meanwhile I'm glad that you have character transmission working. I have been looking for how to turn on an off an LED like in the schematics but I am using a BS2 board of education. Any input or help for that? I am looking to find a set of 4-5 of these transceivers, as they are now discontinued. Anybody have any? PM me please. I know I have a couple or was it four? They were part of my reeducation program. I tested at least 4 units of each configuration. The things that did not work or if they worked and were found to not be feasible for whatever reason live at the bottom of a big box. I am not yet ready to start cleaning out that box. Most every combination of modules and assorted other stuff in the box has Parallax on it although I have salvaged a few things forward. The final best for me was Xbee - BS2 in combo. I am trying to use the RF transceiver that Beau posted the schematics for to light up an LED. I am using BS2 board of education. I want it to light the LED on the receiving robot when my photoresistor gets a specific reading instead of using the button like the schematics showed. I have no idea how to do this and have been looking for wiring and code help with no luck. From the schematics I think my data pin travels to my photoresistor then to VSS? Do I run a pin to my data such as p3 for a power supply, if not how should I wire my photoresistor to the data line? What transmit / receive code do I need to use to test this. I already know my code for the photoresistor. You'll use SEROUT and SERIN commands. There's some example code for these modules. Let me see if I can find it. I have it wired P14 to TR pin and P15 to DATA pin and tried running that sample code and got nothing. :-( am I missing something. Does anything else need wired? Tried it with wiring the GND pin to VSS and still nothing. Looking at that sample code I understand how the code works a little better and think I know how I can modify it to light an LED as well as debug but need to get it to work with the original code first. Success!! I even got the LED to light also!